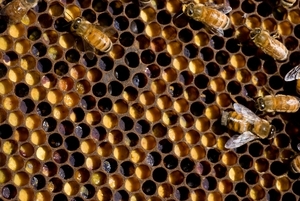 Honey bee comb showing cells filled with different coloured pollen collected from different plants. About one third of all food is produced as a result of insect pollination, and the European honey bee, Apis mellifera), is responsible for about 80% of this. In Australia, farmers rely on large populations of feral European honeybees (managed bees gone wild). The European honeybee is under threat The Asian honeybee, Apis cerana, poses a significant threat to these populations as it is a host to two types of predatory mites with the capacity to wipe out huge numbers of the European honeybee – the varroa mite (Varroa destructor) and the Asian bee mite (Tropilaelaps clareae). Dr Denis Anderson of CSIRO Entomology is currently using molecular and physical methods to investigate the ecology, epidemiology, invasiveness, co-evolution and control of exotic parasitic bee mites and their Asian honeybee hosts.